Question: What phone does Sue have? I've been look all over Google for even some type of hint of what kind of phone it is but I have had no such luck. Chosen answer: I believe it's the Sony Xperia Tipo. Question: I don't understand the ending of the movie when Sue is screaming in her mother's arms and there is a cross on her wall - is she supposed to become a Jesus freak like Carrie's mom, or is her baby gonna have powers like Carrie? Chosen answer: Sue just woke up from a terrifying nightmare in which Carrie's arm reaches out of her grave and grabs Sue. A lot of hospitals have crosses in the rooms. It's been suggested that Sue might have miscarried and lost her baby. Question: What does the grave cracking mean? Chosen answer: It is an implication that Carrie White is not really dead. Answer: It's most likely just a metaphor for the terrible memories that those who survived the prom massacre must have in their minds forever. 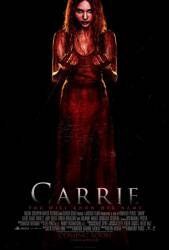 The memory of Carrie White haunts them.